Even though there are no exact borders of the formal Danube Swabian Ancestry Land today, we are speaking of the Danube Basin as the general location. The Danube Basin, part of greater Hungary, was occupied by the Ottoman Empire (Turks) for over 150 years. It was freed by the joint forces of the Germans, Poles, Magyars, Serbs, Croats, and other nationalities under the Austrian Emperor’s mantle in the wars of 1683-1699 and 1716-1718. The Turkish rule ended with the peace treaties of Kilobits and Passarowitz. The whole of Hungary, most of it devastated and depopulated, was reunited under the Habsburg crown. It was then necessary to repopulate the land with taxpayers and soldiers. A Military Zone was established as a bulwark between the Austrian and the Ottoman Empires (Turks), and settled with soldier-farmers from different nationalities. Even though 30,000 Serbs settled in non-military-zone as refugees in 1690, their numbers and agricultural skills were insufficient. The Emperor in Vienna started bringing settlers from all over the Empire, but the Germans from the various duchies, principalities and kingdoms, seemed best suitable for Habsburg ideas, as they were thrifty, law-abiding, diligent, peace loving and willing to strive for better life than they had back ‘home’. 3. The "Joseph Impopulation", which took place under Joseph IIfrom 1782-1787. Many of the approximately 15,000 German settlers from the first colonization were killed in Turkish raids or died from bubonic plague. The second major migration of approximately 75,000 German colonists had to rebuild the settlements all over again. It took much hard work to re-establish the towns, clear-cut the forest, and turn the wilderness into fields. With the third wave of approximately 60,000 German settlers, the economic prosperity of the Hungarian farmland was secure. The Habsburg Emperor reserved all of the Banat area as his own domain. The government was eager for the colonists to be successful in the shortest possible time, so the settlers were given financial aid, tax exemption for some years, a free house in Banat, grain, tools and other items. At the same time the individual landowners (Nobility and the churches) tried to entice the colonists with better promises to settle on their land instead. And many did, even though the only financial aid they received when settling on manorial estates was the tax exemption of three years. The settlers also had to have 200 Gulden as starting capital. The embarkation point for their journey was the cities of Ulm in Swabia and Regensburg in Bavaria, both on the River Danube, which was the major traffic route to South-East Europe. As more and more colonists headed for Hungary, soon special river floats were built. These Ulmer Schachteln, transported the travelers down the River to Vienna where the settlers had to register in order to receive the information and destination documents. Both Emperor Karl VI and Maria Theresia insisted on Roman Catholic settlers only, but others were eventually permitted to enter the land as well, in order to speed up the colonization. With the emigration from the various German duchies, principalities and kingdoms, the Swabian colonists continued to stay loyal subjects of their Holy Roman Emperor. He was at the same time also the King of Hungary. The settlers were invited to bring their customs, their language, their teachers, priests and pastors with them. Over time the connection to the old homeland diminished all together, as Danube Swabians became a recognized minority in what later was known as the Empire of Austro-Hungary. The earliest major Danube Swabian settlements were Swabian Turkey (counties Tolna, Baranya and Somogy south of Lake Balaton), Banat (east of the Tisa River), Batschka (between the Rivers Danube and Tisa) and Syrmien (the eastern-most corner between Danube and Sava Rivers). The renowned thriftiness and working habits of the ethnic Germans colonists made it possible for the Danube Basin, also known as the Pannonian Plain, to become the breadbasket of Europe by the third generation. Their prosperity brought also a population explosion, and new areas for settlement were opened up: Slavonia (after 1865) and later Bosnia. In both cases mostly the Danube Swabian sons and daughters from the Swabian Turkey bought farms there and soon prospered also. In 1910 about 1.5 million Danube Swabians lived in Austro-Hungary in five major settlement areas. 80,000 in Budapest (9 percent). See also Swabian Turkey History. The winds of change were not kind to Austro-Hungary in 1918. 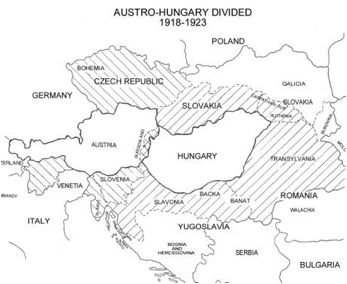 It lost the war (WWI, together with Germany) and Austro-Hungary was divided in eight different parts at the Treaty of Trianon (4th June 1920). This resulted that now the 1.5 million of Danube Swabians were split in three different successor states of the Habsburg Monarchy. The eastern Banat and Sathmar fell to Romania. 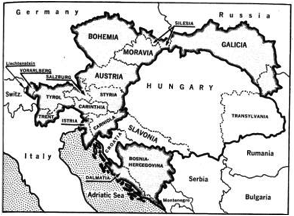 The western Banat, the Batschka, the southern Baranya triangle, Syrmien and Slavonia went to the newly created Kingdom of the Serbs, Croats and Slovenes (from October 1929: Yugoslavia). The remaining settlement areas stayed in what was left of Hungary, which shrank to 31% of its previous boarders. Some Danube Swabian families had now close family members in different countries, where different laws, languages and customs were imposed. The name "Donauschwaben" (Danube Swabians) was created around 1920, just after Austro-Hungary was divided, by a Robert SIEGER. The name was assumed also by the geographer Hermann RÜDIGER from Deutsches Auslands Institut in Stuttgart in the works of DAI to differentiate the diverse groups of ethnic Germans in south-eastern Europe. The Donauschwaben and the Transylvanian Saxons [i.e. Siebenbürgen Sachsen / Erdélyi Szászok / Sasi] and was used again in 1935 in the "Handworterbuch des Grenz- und Auslandsdeutschtums" [published by Carl PETERSEN, Paul Hermann RUTH, Otto SCHEEL, Hans SCHWALM, vol. II, Breslau, 1935, pages 290-305]. Already around the end of the 20th century many young people were looking for work in other lands, mainly the Americas, always hoping to save enough money there to return home and buy their own homestead. Many did so, but some decided to put their roots in those new lands instead, where they thought the opportunities were better. By the time WWII spread over Europe the good fortune of the ethnic Germans changed dramatically. Even though they were subjects of different nationalities, the Nazis succeeded to make the ethnic Germans a pliant instrument of their foreign policy in order to achieve Hitler’s goal of gaining Lebensraum in the East. By 1944 it was clear that the local population (Hungarians, Croats, Serbs, Romanians) used the Danube Swabians as scapegoats for the Nazi’s atrocities. The Partisans in the Yugoslavian areas viciously attacked many Donauschwaben villages. There was talk in Berlin about resettlement, but the implementation of those plans if any, came too late. 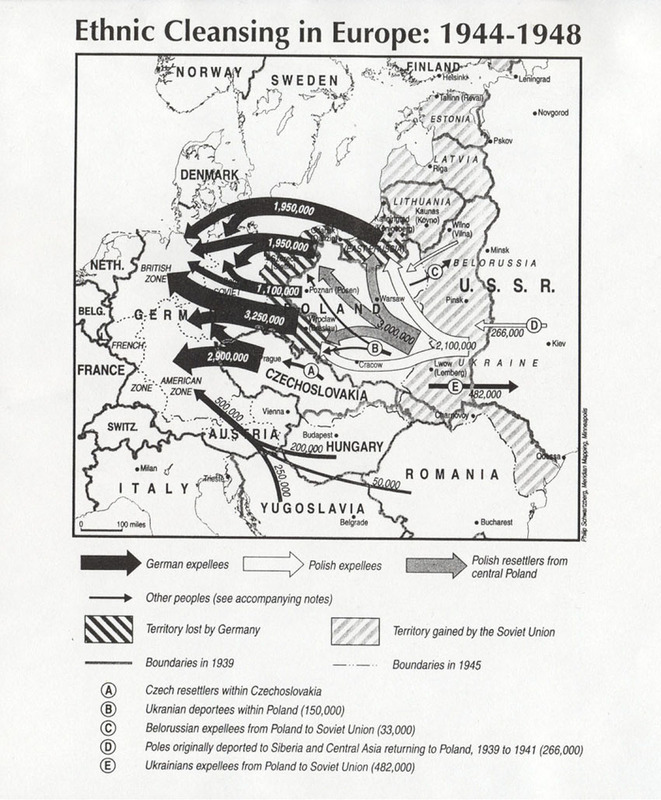 The Danube Swabians in the Romanian Banat were the first who started fleeing just ahead of the approaching Soviet Red Army, with the Slavonian Donauschwaben following. Some Batschka and Syrmien’s Danube Swabian as well. However, most ethnic Germans considered themselves as having had nothing to do with the Nazis at all and decided to stay, soon to regret it bitterly. The period 1944 through 1948 was the most tragic part of the Danube Swabians 250 year history. During those years they were subjected to victorious communist partisans and the Red Army atrocities; they were plundered, shot en masse, incarcerated and manhandled or were sent to the Siberian Slave Labor Camps. They were dying in the thousands during those years. They were sent to the Baragan Steppe in Romania or the Death Camps in Yugoslavia with the goal to eliminate them from the earth, under the pretext of ‘collective responsibility and collective guilt’. At the Potsdam Conference between 17th of July to 2nd of August 1945) the Allies (USA, Great Britain, Soviet Union) made the decision to remove the ethnic German population from outside of Germany proper, with the understanding that it should be carried out ‘in orderly and humane manner’. In the practice this ‘humane manner’ was nothing but illegal land-grab and inhumane treatment of some 15 million ethnic Germans of who five million were the Danube Swabians. Most managed to escape to Austria or Germany, but more then 1.5 million lost their lives between the end of WWII and 1949. 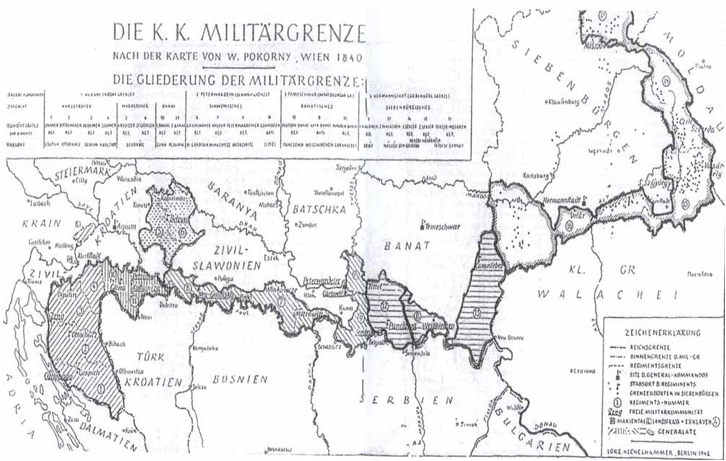 Redrawing Nations: Ethnic Cleansing in East-Central Europe, 1944-1948. Edited by Philipp Ther and Ana Siljak. Rowman & Littlefield Publishers, Inc: 2001. Today the Danube Swabians and their descendants are living all over the world.